There must have been a collective groan of despair at Borussia Dortmund when Bayern Munich reinstalled Jupp Heynckes as head coach on 6 October. The man who had plotted BVB's downfall some 52 months earlier was back – with the same objective. As was the case in summer 2011 following the first of Dortmund's back-to-back Bundesliga title wins, Heynckes – now 72 and entering his fourth stint at the Bayern helm - stepped into the breach with a menacing black-and-yellow shadow hanging over Germany's most successful club. The defending champions' faltering start to the 2017/18 campaign, juxtaposed with Dortmund's near-flawless run under Peter Bosz, had opened up a five-point gap at the summit. Bayern's dominance – an unprecedented five successive Bundesliga titles – was under serious threat. That was five weeks ago. 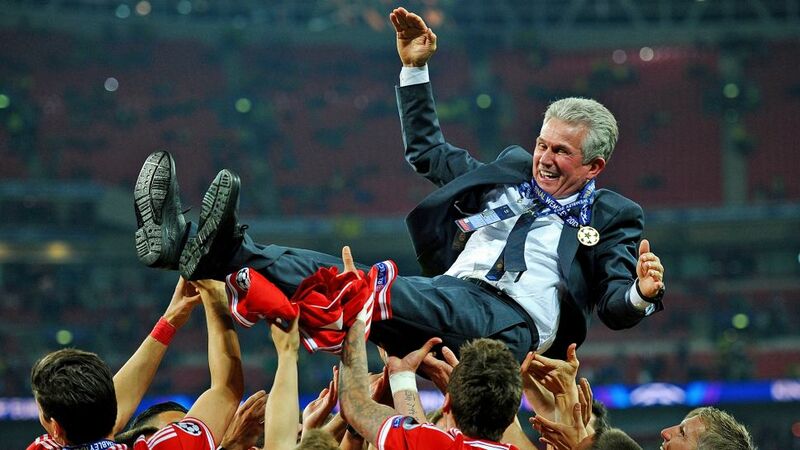 Since then, Heynckes' Bayern have effortlessly pieced together a six-match winning run in all competitions. They have qualified for the UEFA Champions League Round of 16 ahead of schedule; a sizeable obstacle, in the form of RB Leipzig, was successfully negotiated in the DFB Cup second round; while three Bundesliga wins on the trot – against Freiburg, Hamburg and Leipzig – have returned Bayern to the domestic throne for the first time since they lifted their 26th Bundesliga crown in May. What better context for Saturday's Der Klassiker on Dortmund soil? Admittedly, Heynckes' head-to-head record as Bayern coach in games against BVB is nothing out of the ordinary (W6, D5, L6), but it is his most recent Klassiker triumph that, for the time being at least, defines his love affair with the red ballet. Bayern had already ended Dortmund's two-year Bundesliga rule and dumped the then holders out of the 2012/13 DFB Cup, when the German behemoths met in the first ever all-German UEFA Champions League final. Mario Mandzukic and Ilkay Gündogan exchanged goals in a pulsating encounter, but it was to be Bayern's night – and year – as Arjen Robben rolled in a dramatic winner to send the red half of Wembley Stadium into raptures. Inheriting one of Bayern's all-time great ensembles, Pep Guardiola and Carlo Ancelotti added their own brush strokes to the legacy - namely four Bundesliga titles combined - but now the forefather is back, every bit the redeemer he was all those years ago. "I didn't plan to return, but FC Bayern Munich are very close to my heart. I wouldn't have returned to any other club in the world," Heynckes said after being appointed on a short-term deal until the end of the season. "I want to bring successful football back to the club, but I won't be staying longer than the terms of my contract." Heynckes has already delivered on one count – so much so that Bayern can go six points clear of BVB with victory in Der Klassiker at the weekend. Dortmund fans will be hoping the all-conquering old-timer keeps his word on the second. Borussia Dortmund vs. Bayern Munich: Vote for you Klassiker dream team now!